ISE 2013 was the biggest yet. With 894 exhibitors occupying 33,000 net square meters of floor spaces. Thousands flocked to Amsterdam to catch up on all that is exciting in residential & commercial AV as well as digital signage. As usual HomeToys.com was a Media partner with ISE 2013 and features a Special Newspage devoted to all the News, Announcements and Information coming out of this years event. Click here for our ISE 2013 Newspage. Along with the newspage we have compiled a neat and tidy list of some of the exciting new products featured at the show this year below. The new Hi-Fi 2 4×4 provides an affordable distributed audio option with 20 watts per channel that fits directly into a Leviton Structured Media Center wiring enclosure at half-width. As with the entire Hi-Fi 2 line, the new 4×4 model allows users to listen to and share music sources with any room that has speakers connected to the device. 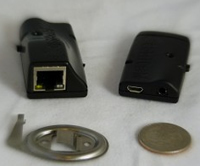 Both local and remote source inputs are standard features, with optional wireless Bluetooth connectivity. The Remote Input Module (RIM) features a routed IR emitter jack for remotely controlling existing source equipment from any room that has a volume source control. Users will be able to control the new system through HAI by Leviton’s free Hi-Fi 2 app available on iPad, iPhone, and iPod Touch. 2-SPDT relays; 2- Signal Sensing Inputs; and Multiple simultaneous two-way TCP connections, this is a powerful piece that comes in at under $1000.00USD ($989.00USD retail)! As with all BitWise controllers, the BC2 is made in the USA and can be used as a standalone piece, or as part of a Multi-zone system for residential or commercial use. There will be rack extension ears available separately, and the BC2 ships with a Level 4, dc converting power supply and feet for sitting on any surface. 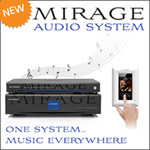 The Mirage Audio System represents a complete solution for up to 96 zones of pristine audio distribution featuring the most popular streaming music services and audiophile grade playback of local music files. The M-400 and M-800 amplifiers represent the state of the art in digital whole home audio solutions. These high powered (50 watts per channel), IP controllable amplifiers offer a suite of modern features integrators will appreciate in today's high-tech, IP based environments. Paired with either of our award winning media servers the MMS-2 or MMS-5A digital audio server, you can provide your customers with simple and convenient access to their iTunes music libraries and online services Pandora, Rhapsody, Spotify, Last.fm, SiriusXM and TuneIn Radio. The Mirage Audio System is intuitively controlled using the devices your customers know and love, including iOS, Android, and any web-enabled computer or tablet. For in-room control, the simple and elegant KP-1 provides local control of volume, source, and power. The more advanced KP-iOS provides a beautiful iOS-based touch screen solution for more active areas of the home, adding full library browsing capabilities with rich meta-data and album covers. The Mirage Audio System works seamlessly with all the popular automation systems with pre-programmed control modules, user interface templates, and world class integrator support. Today, commercial buildings are smarter than ever before and require a fundamentally new approach to building management. Crestron introduced the European Market to its Integrated by Design™ solutions during ISE 2013. Crestron 3-Series™ Control Systems with BACnet®/IP support form the core of any modern building, integrating and managing all the disparate technologies throughout the facility to impact productivity, efficiency and cost savings. Built-in BACnet/IP support enables seamless integration with existing building management systems. 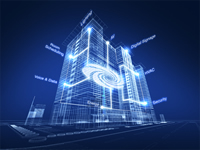 All systems run independently and communicate with each other on the same platform, creating a truly smart building. Aurora's 2nd generation Digital Xtreme Matrix (DXM) switchers now with HDBaseT CAT I/O cards offering 1080P 60Hz transmission over single CAT cable up to 600ft. All units with auto EDID learning and management for ease of setup. Associated HDBaseT Tx and Rx modules are remotely powered by the DXM units over CAT cable. The new units also offer flexible RS232 signal routing to individual outputs or to all outputs simultaneously for unprecedented display control. With a full assortment of Input cards no format is left behind with crystal clear digital conversion to 1920 x 1080 60Hz. The HD-SDI to HDMI Extender Kit (500715) converts HD-SDI to HDMI and then transmits it up to 330 ft (100m) via Cat5e/6 cable at all resolutions in a point-to-point configuration. The HD-SDI to HDMI Extender Kit supports transmission of up to 2.97/3.0 Gbps uncompressed, un-encrypted digital video (optionally including embedded Audio and/or Time Code) within television facilities and between professional video equipment. 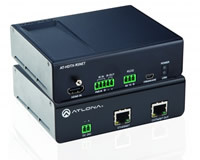 Atlona® introduces new HDMI® Extenders over HDBaseT Lite, which are designed to send audio/video, IR control and Power over Category cable (PoCc) over a single category cable. The AT-HDTX (transmitter) and HDRX (receiver) are perfect for moderately-priced home theater installations, while the AT-HDTX-IR and HDRX-IR gives you system IR control. If your installation requires bi-directional IR, RS232 and Ethernet Pass Through, the AT-HDTX-RSNET and AT-HDRX-RSNET is your choice. “Our newest family of extenders takes video to galaxies far, far away, or at least beyond the technical limits of standard HDMI” said Steve Heintz, senior product manager, Atlona. “Via inexpensive field-terminated cable, and featuring advanced HDBaseT™ technology, they reliably transmit and receive over single category cable”. 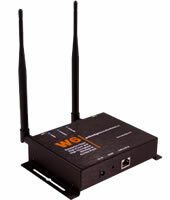 The W6 series offers three wireless deployment options to accommodate any size network. First, they can be used in a standalone WAP configuration utilizing their built-in "intelligence" that enables them to be easily configured. Second, Pakedge provides a PC and Mac software discovery tool named "Where's My WAP" to quickly find and easily change its IP address. Finally, Pakedge offers a hardware macrocell wireless access point controller (C36) that enables access points in a very large wireless system to be centrally deployed, configured, monitored and updated. W6 devices are optimized for use with smartphones, tablets, laptops and home control devices. The W6 software takes an entirely new approach to 802.11n performance, in handling environmental wireless "noise" and the interference resulting from the fact that Wi-Fi is an unregulated frequency spectrum. The W6 family's proprietary algorithms optimize the devices' signal-to-noise ratio, leading to higher throughput at longer ranges and more stable performance. W6 devices are especially well suited for use with 802.11n devices that use a wider channel width, because the wider the channel, the more susceptible the device is to interference. Pakedge W6 products utilize Power-over-Ethernet (PoE) connectivity for a more efficient installation. SMP-200, the smallest media player within CAYIN's product portfolio, weights only 655g for users to facilitate installation in different venues. It is also extremely energy-saving with the maximum 6W power consumption. SMP-200 inherits all the core features of CAYIN's zone-type digital signage player and can playback videos, images, tickers, and clock in seven zones. In addition to updating content via USB flash drive, FTP, and Network Neighborhood, the new player provides users with another choice to update content by a SD card, which comes in handy especially in case of environments without any network access. C2G presented its RapidRun line of products-the most complete modular cabling system built to save installation time, accommodate changes, and evolve with customers' constantly expanding needs. Trusted by integrators, installers and end-users, RapidRun's reputation for quick and effortless in-wall A/V connectivity is unmatched. More and more projection screens are being installed in multiple use settings where ambient light can create a "washout" effect. During Integrated Systems 2013, Draper Inc. is addressing the problem with a new projection screen surface. Draper's High Performance XS850E not only offers superior ambient light rejection capability, it also features precise resolution, high contrast, a vivid color palette, and a remarkably broad viewing cone. "High Performance XS850E gives a nice bright image in the dark or with ambient light," according to Draper Fabric Coordinator Brian Hocker. "What makes this surface really special, though, is that you see the same great image off axis, and the contrast levels are excellent in all conditions." High Performance XS850E is available on Draper's Clarion and Onyx fixed screens. Mystik! is Stewart Filmscreen’s answer to self-adhesive projection film material designed for use in digital signage applications. Mystik! is ideal as a storefront application as well as in other retail and public venues. As a residential solution, Mystik! offers the homeowner the opportunity to convert a picture window into a large outdoor display window for Holidays, Super Bowls and other major events. Genelec's Intelligent Signal-Sensing technology has been developed to meet with both European Union ErP Directives and the company's own wider sustainability commitments. This new technology will be applied to the entire catalogue of Genelec loudspeakers to minimise energy waste and significantly reduce power consumption when items are left in standby mode. Genelec integrated amplifiers will now have electronic activity detection circuitry built in. This Intelligent Signal-Sensing (ISS™) monitors the input connectors and detects if the monitor or loudspeaker is in use. If voltage swings are large enough to be considered that of above standard audio outputs, the product will continue to function. However, if the ISS circuit is not finding any audio on the input for a period of time, ISS automatically puts the loudspeaker amplifier to a low-power sleep state where the loudspeaker will consume less than 0.5 watts of power. Additionally, the Flex is designed to work with the cloud-based Global Caché IR database. Employing the cloud-based IR database, IR codes are easily identified, downloaded, and stored in the Flex. This special architecture provides a platform for ease of installation, and flexibility when equipment is changed, swapped or upgraded. The Display Development IW7 and IW8 systems include single-chip DLP® projectors, VP 100 video scaler for high performance processing and flexibility, and Smart Cooling technology for efficient, reliable operation. Designed for popular screen sizes, the IW7 boasting 4,200 Lumens, is ideal for brightly lit family/media rooms, while the IW8 outputting 1,800 Lumens, is capable of delivering the color accuracy needed for a true home theater system in a light-controlled environment. The IW systems create a TV solution that is far superior to a flat panel in terms of image size, fidelity and overall experience, with no impact on a room's decor, coupled with the ability to provide a completely concealed system when not in use. 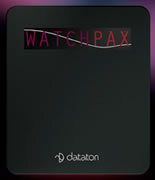 WATCHPAX comes in a discreet and stylish matte black aluminium finish measuring a tiny 127 x 148 x 22 mm. It takes up the minimum of rack space or simplysits discreetly on the back of a flat-panel display. The unit weighs only 470 grams and consumes very little power. WATCHPAX runs over any standard network, ensuring that the management and ownership of WATCHOUT is easy to use, even remotely from anywhere in the world. Despite its small form factor and low power consumption, WATCHPAX is a very powerful media server taking full advantage of hardware-accelerated video playback. It's designed to match the specific demands of distributed systems and multi-room installs, without the hassle of running long video cables. This innovative product gives homeowners full control over their KNX based systems with a minimum of effort and a maximum of style, thanks to the control devices available in the Vantage home automation system. The simple and intuitive interface provides control and feedback to any Vantage touchscreen, iPad, iPhone, Android device, etc. With the push of a button or a simple gesture on a touchscreen, a homeowner can effortlessly control the KNX based devices. In addition, the homeowner receives status feedback visualization from all of these functions. The interface communicates with the Vantage main controller over a network (LAN) connection. On the KNX side the interface is provided by a KNX bus terminal port. Configuration is performed with Vantage Infusion Design Center and the KNX ETS software, and the interface supports up to 250 group objects (DataPoints) and 10 simultaneous client IP connections.